Overview: Framed for a crime he did not commit, Carl Lucas is sent to Seagate Prison in the deep south. Lucas volunteers for an experiment conducted by the prison doctor, Noah Burnstein. Doused in a mixture of chemicals, Carl Lucas finds himself with steel-hard skin and solid muscles. Lucas makes a prison break and goes on the run to clear his name. Playing around with his name, he takes on the new identity of Luke Cage and takes on the name to become Power Man, a hero for hire. Over the course of these stories, Cage sets up shop in Times Square, above a movie theater that only shows westerns and run by would-be-filmmaker D.W. Griffith. Dr. Burnstein returns to set up shop in New York City, aided by Dr. Claire Temple, who quickly becomes the girlfriend of Cage. Cage is eventually able to get his record cleared, and becomes a true hero for the people in downtown New York City, provided their money is green. Fighting a mix of street thugs and one-appearance villains, Cage does get to tangle with Dr. Doom early on in issues #8 and #9, when he is hired to track down some robots. When Doom bails on the payment, Cage travels to Latveria to collect his $200. Sweet Christmas! Another notable event occurred in issue #24, when Dr. Henry Pym’s lab assistant, Dr. Bill Foster, takes a dose of Pym particles and becomes Black Goliath. He would later drop Black from his name, going by just Goliath, and he would appear in and out of costume up until the events of Marvel’s Civil War. What makes this Essential? : Again, this is a border-line essential book. With an African-American leading his own title, this is an important change for the lily-white look of Marvel Comics to date. The problem I have is that this reads like a comic-book adaption of Shaft and the other blaxploitation features of the early-1970s. Cage is a better character, and I think we should be thankful that the character has grown well past his early origins. As an early study on the character, you could consider giving this a read. However, you might be better skipping ahead to Essential Power Man & Iron Fist Vol. 1, when his partnership with Danny Rand helps offset the over-exaggerated rage of Luke Cage. Footnotes: Luke Cage is one of the first African American characters to have his own title. The first is attributed to Dell Comics, which published a two-issue western called Lobo in the mid-1960s. If you like this volume, try: the Milestone Comics properties from the mid-1990s. Released by DC Comics, Milestone was created by African-American artists and writers that felt they were under-represented within the comics industry. Creating an entirely new universe of characters based around the fictional city of Dakota, titles in the line included Hardware, Static, Icon, Blood Syndicate, and later Shadow Cabinet and Xombi. Several of the characters have moved into the DC Universe proper and have been included in comics as well as the Young Justice cartoon series. There are various collections on some of the titles, but you may need to dive into the back issue bins to track down all issues of the various series. This entry was posted in Marvel Essentials, Power Man & Iron Fist and tagged Archie Goodwin, Bill Mantlo, George Tuska, Len Wein, Luke Cage, Steve Englehart, Tony Isabella. Bookmark the permalink. Pingback: Throwback Thursday – Essential Luke Cage, Power Man Vol. 1 – WORST. COMIC. PODCAST. EVER! 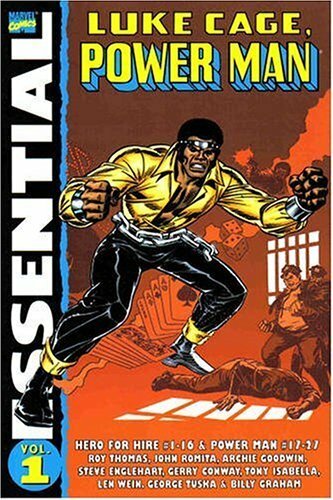 Pingback: Throwback Thursday – Essential Luke Cage, Power Man Vol. 2 – WORST. COMIC. PODCAST. EVER!